“The thief cometh not, but for to steal, and to kill, and to destroy: I am come that they might have life, and that they might have it more abundantly (John 10:10).” Somebody said, ‘watch who you let in your house…or stuff will come up missing–like love, joy, peace, etc.’ Indeed, we must be watchful of our associations. Every acquaintance should not be a close friend. Most of us know at least one or two people that will deplete us of all of our energy and drain us emotionally after a very brief, dramatic encounter with them. We would be wise to take them in small doses…or we’ll end up worse off after each encounter. Many New Testament scriptures advise us to be of one mind (II Cor. 13:11; Rom. 12:16; Phil. 1:27; Phil. 2:2; I Pet. 3:8). I can’t control the mind of the next person…so the best I can do is to control my associations. We must surround ourselves with like-minded people. That is not to say that we will agree on every detail. However, on the things that matter (eternity, for example), we will either agree or eventually separate. For after all, how “can two walk together except they be agreed (Amos 3:3).” If I’m pulling one way, and you’re pulling the other, it would be impossible for us to walk together and be at peace with each other. Of course, we understand that there are those who don’t want to be at peace–those that prefer to continually “stir the pot.” Some are not happy unless there’s contention. On guard. “Keep thy heart with all diligence; for out of it are the issues of life (Prov. 4:23).” Let nothing and no one steal your joy (the joy of the Lord is your strength -Neh. 8:10); your peace (He will keep him in perfect peace whose mind is stayed on Him -Isa. 26:3); or your love (This is my commandment, That ye love one another, as I have loved you -John 15:12). Thanks for visiting, following, subscribing. Take care & be blessed. This entry was posted in Motivational, spiritual and tagged Christian, God, guard your heart, joy, love, one mind, peace, thief. Bookmark the permalink. Thank you for considering this worthy of a reblog! Not lately. 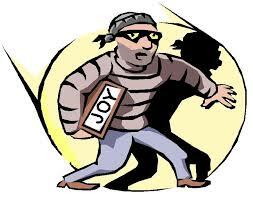 But situations and life in general can rob you of your joy if you loose your focus. Absolutely…we must keep our eye on the prize! Good stuff here. Keep on posting. Thank you, friend…and you do the same.